I have finally decided to call the layout Pen y Bryn, so i've collected the pictures from various posts of mine and included them here. They show shots of the layout from around ten years ago and also recent pictures where i've added a lot more detail, hopefully you should see a difference with the pit and loco shed scenes. Good idea Phill and great pictures. To make things a little easier on the viewer I have edited your post and put 3 or 4 returns between each picture. "First-class attention to detail there, I have enjoyed studying the pictures"
A truly stunning layout Phil. As Doug said, the attention to detail is remarkable. Many of those shots could quite easily have been passed off as photos of the real thing and nobody would have been any the wiser. I guess trying to make it look real is the main problem, sometimes it works better than others. Phil.c wrote: I guess trying to make it look real is the main problem, sometimes it works better than others. In the B & W shot? Yes Shaun, the B&W shot. 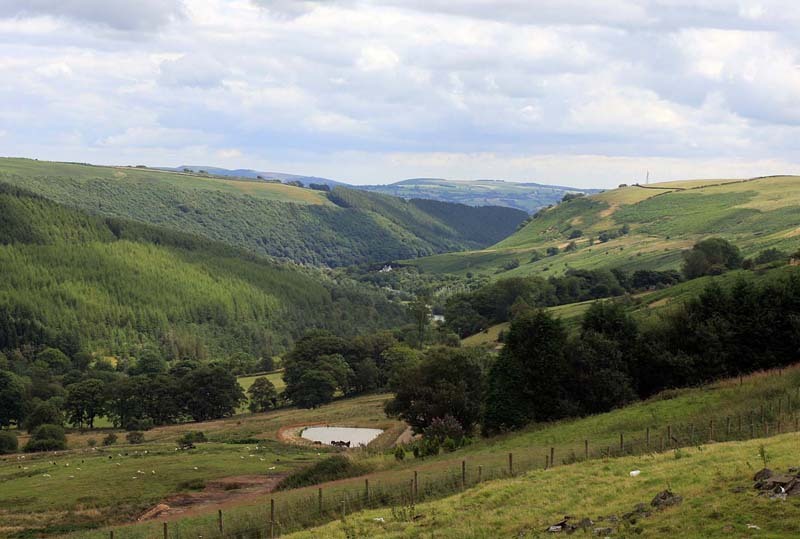 I'm about 5 miles SE of Merthyr, 15 miles North of Caerphilly. There's a whole lot of Photos of the Month in this thread ! Very, very nice, and looks fun to operate too. After getting back to it after 10 years, I re-wired it and bought a DCC unit, I've also added sound loco chips. Pity you aren't further West - it's a bit lonely over here! I think there are only three of us in Pembs/Carms/Ceridigion. I've not been able to do much with the layout lately due to various commitments. Look forward to seeing more, Phil. Probably the foreground area in picture five will be the next job. Your photography is as good as the layout ! Nice shots of a beautifully detailed layout. I especially like shots, 6 (signal box), 11 (goods shed/yard), 16 (under bridge), 24 (smokey engine sheds/yard) and 25 (side of engine shed close-up). Beautiful, not saying the bar is high, but i'm almost 6ft tall, and if I took up limbo dancing, I wouldn't have to bend. Here's my efforts so far with detailing this area. It must be all those years of engraving that gives you the "eye" for the detail. Absolutely mind blowing. I take my hat off to you Phil. That really is modelling at its absolute best with superb attention to detail. It really is excellent, Phil. Terrific work Phil - I couldn't hope to achieve that standard of detail. Hat's off to you! And the road surface under the lorry. How did you do that? I can't remember the make of the corrigated sheets, I think they are Slaters, they come in about A4 size. The area under the lorry, it looks like cracked concrete and it also looks difficult to do convincingly....not so, in fact the base is chipboard, this is the area where I did all my cutting, ie. plastic sheet etc, and it's just the knife marks left from this and painted grey. Has anyone guessed what the lorry load is yet! I too enjoyed the pictures, some lovely modelling there with great attention to detail - super stuff well done. Do you mean what it's made from Phil or wht it's a model of ? If the latter, some kind of mining machinery, if the former, the front bit looks like a bit of plastic sprue (judging from the little "blip" in the middle and is the rear bit a "rectangular tank" from one of the Dapol offerings ? Looking back to the previous shots - what are the windows ? They look very "3D" so are they etched or plastic stuctures ? Also, I'm assuming the stone wall (for the overbridge enbankment) is embossed plastic - it look great - but what's the black "hole" at the top just above the lean-to shed ? Slate rooves - card ? plastic? or what. Did you just pick out the "new" slates ? Loads and loads of little details in there - fabulous stuff. Peter, that area is just the chipboard baseboard for the model, I painted over the scratches/cuts etc and to me it now looks like cracked concrete. The front item of the load is the (I don't know what it's really called) electrical component taken from a Bachmann loco when converting it to DCC, the back item is the diecast firebox unit from another loco. Clever stuff - I see the capacitor now you've pointed it out. Waste not, want not eh. Wills, I think windows, slates (individual ones picked out) and embosed wall, small packs, about 4" x 3" sorry to be so vague but i'm working in my studio in the loft and my layout over the garage. Can't see a black hole? can you ring it? It should be called, Pen Y Bryll. I was most impressed with the treatment you gave to the little people as well. Are you sure you didn't sneeze on your monitor, Peter? This area is still to be detailed. Realism taken to new heights, brilliant Phil, especially the first one. How in the world did you even get the camera down in there? Well observed and superbly executed modelling. I take my hat off to you Phil. It would have been easy with a small camera, you know the compact ones, I have a 12mp but I didn't want to use it because it has a small lens so I used my Canon 40 D with a 28 x 70 lens, it just squashed into the area but focusing etc was difficult. I really like your weathering Phil, maybe some day you can explain how you do it? What really caught my eye is the blending and how smooth it looks. Wayne, the trick is to use a limited palette and spread the colours throughout the scene and with no abrupt changes. Tremendous modelling in every respect; well done. Wayne, the trick is to use a limited palette with no abrupt changes. No abrupt changes, yep, that's my problem! About 28' in total, a bit of a nightmare to install though especially with the sloping cieling and having to lean over everything with the wide part. Pictures 3 and 7 were Photoshopped in the corner. You're right Phil - the backscene makes a huge difference. The layout was fantastic BEFORE you added the backscene - now you've taken it into a whole new dimension. This picture is a stunner. The white house, caught by the sunlight, stands out beautifully from the dark hill where presumably, a storm is brewing. How many times has a scene like this been used in "art books" to define contrast. An iconic scene brilliantly captured. Forgot to ask - what are the backscenes ? The backscenes are ID, they are excellent, they come as two 5' lengths per scene, it's possible to much up some of them to make a long scene, they're on thick paper too IMO well worth the price. They are indeed very good backgrounds, perfectly matched by a very natural looking foreground. Great modelling and photography Phil. As a matter of interest are the backgrounds permanently installed. Or have I missed something somewhere. They are now permanently installed Robert, I wish though that they were available before the scenery was started, but I am talking about a long time ago! I'm not normally a big fan of backs cenes, Phil - but they are superb. Once again, great pics ! As Phil said, they are well worth the price. ... but it's your photography/lighting that brings them to life, Gary. The first two pictures were taken with natural light which is the best, this was from roof windows, the rest were with two 500w photo floods placed together. Fantastic modelling Gary. Are you using the 9" or 15" backscenes? What can anyone do but admire Phil. Stunning, absolutely, especially the black and white picture. As Bob says, absolutely stunning. They really could be shots of the real thing. You must be chuffed to bits with them. Where did you get the smoke on the Prairie (?) in the last B/W shot ? I'm not usually a huge fan of "shopped" photos but that one looks extremely realistic. It always amazes me the difference between viewing from a standing position and ground level, from almost toy-like to realistic. I have just come across this thread and have just been gobsmacked at the wealth of detail included and your eye for getting everything to look natural. Many thanks for posting and please keep on doing so ! Thanks Ray, for the very nice comments. There is still a lot to do with this layout, the station for example, at the moment only the platforms exist, I haven't even thought about what buildings to create. There are also a few area's that could be added to, to the right of this picture for one. This was a quick snap with a pocket camera so the depth of field is not as it should be. I'd say everything to the right of that shot is perfect Phil - I'd be chuffed to bits if it were a part of my layout. If it needs "seeing to" it will be really interesting to see what you add. The difference between an ordinary guy and a Master eh !!!! Actually Peter, it's the area behind the storage building which is on the right, I don't have a picture of this part but you can see it from my layout plan. To say I was impressed with the standard of your modeling and backscene would be a great understatement. It's outstanding. You must be very proud of the layout. Then am I ever glad I'm just stating out! Gary wrote: Once again, great pics ! Link bookmarked with many many thanks !!! ps.. luv your work !! Phil, I have never been on another forum, only this one. I have heard that about other forums before though. I really like this one, no one shuns you or puts you down. After all, we are all learning this hobby, though from the looks of your pictures you are leaps and bounds above me. Your photos look so life like, it's really amazing. Great layout and great photos. As a newcomer your work is an inspiration. Well done. Here's an area that needs a lot of work, I have'nt decided on what station buildings to create yet and also what to do with the areas either side. The backs of terraced houses is an idea but there's not much room because of the ceiling angle. I've also chucked in a few extra pics. I think I have just been looking at some of the best pictures we have had so far on the forum. Many congratulations on your skill as both a modeller and a photographer Phil. Robert wrote: I think I have just been looking at some of the best pictures we have had so far on the forum. Many congratulations on your skill as both a modeller and a photographer Phil. In total agreeance with you on that one Robert. Perhaps the ceiling angle is sometimes an advantage in photographs - cuts out shadows and glare. To be honest, I would rather there not be an angled ceiling as it restrics modelling. As for the pictures, I am far from being anywhere near a professional but this is what i've found. A camera which has manual focusing and adjustable settings ie f stops and shutter spead and a tripod and also good lighting is good to have. One of the key points is the composition, this is what makes the picture, combined with the light and shadows. Most pictures need correcting, programs such as Photoshop are excellent for this where colour balance, levels and sharpness can be adjusted, also desaturation as the colours in some picture are too strong and un-natural. I see some pictures posted which look good but with some extra tweeking could look great. What always gets me is, looking at these layouts at standing height they look good, but dropping down to the picture level, all of a sudden we are in the scene and it's real....it might also be a nostalgic thing too, remembering those early times when I used to visit the guys down the bottom of my street in the signal box! Here's some more...let me know when your sick of em! The last one is interesting, it's a Photoshop'd watercolour. Planning permission has been passed for the factory area and the first building construction has started, no idea what's going next to it yet, but that overscaled balast has got to come up! I am sure that this will turn out to be another wonderfully detailed scene, Phil, when you have finished it. You have already included as much as I usually manage to get around to adding. By the way, thanks for sharing your experience with the International Models backscene. Having seen (no pun intended) yours, I ordered one myself and am very pleased with it. Stunning! It's right up there, this layout - and the photos . . . Thanks Martyn, hopefully that was the idea. Geoff R wrote: I am sure that this will turn out to be another wonderfully detailed scene, Phil, when you have finished it. You have already included as much as I usually manage to get around to adding. The painters have started, left factory roof, grey, main building, thick water based paint straight onto card giving a textured appearence, also brick pointing wash on right factory. Damn! That's quick...and very good! I'm coming to the end of my superlatives here, Phil. Marvelous. What is interesting when you see this era captured is the stark difference in health and safety attitudes in those times. No hi-viz gear, no safety harness . . . The factories are nearly done, i've dug up the over scale balast, re-balasted and the weathering goes on tonight so some finished pics later I hope. Great news Phil. Chris is still a member of this forum by the way and his work is shown on several of our pages. Ooops, my mistake Ron. That was because his layout pictures are still on here. Robert wrote: Great news Phil. Chris is still a member of this forum by the way and his work is shown on several of our pages. Thanks Robert, I hope it will do the mags justice! I've checked it out and will leave a reply when i'm accepted as a member. Knowing that your layout is going to be featured makes you look at it in a different way, i'm finding lots of things to do to make it more acceptable, i've spent most of today just working on the area in front of the tunnel. Adding foliage, trees and generally making it look better I've rummaged through old boxes of stuff that I haven't looked at for ten years, found some etched point levers, three link screw couplings, signal kits (made one which has gone next the the signal box) ground signals, etc. etc. and that's the simple part of the layout! Just spent some time on this area. I've just been catching up with developments here Phil and I have to say, WOW !!! Great news about the publicity but it's good to know "we saw it first" on here. The transformation of the factory from pristine plastic to finished article is something to behold. A brilliant job. Each little scene has so much to offer. Nothing we didn't know was there but things we'd have missed out if we were doing it ourselves - regardless of the quality of our finished work compared with yours. I'm sure I've said before that it's the attention to detail that moves a model railway into being a miniature version of the real thing. Pen y Bryn is a layout that has, without any doubt, successfully made that move. Thanks Peter your kind words are appreciated! These new pics were taken with my new light setup, I'm still experimenting with it, 2x 7 bulb sets, total of the equivellent of 5000w, here's the link. Moving on to detailing this area, the trees especially needed work compared to previous pictures posted. That tree is superb Phil. What did it start out as and how did you make it look so brilliant ? It started out as a hydrangea flower minus the petals, Polyfilla was added to the trunk which was then painted. Woodland Scenics was stretched over the branches and then WS's foliage. Hair spray was used as adhesive. As it was, the tree was not big enough and not quite the right shape so copper wire was pushed into the centre to create an over hang and all of the above was added again. Great looking layout Phil, the way you've blended the scenery in is superb, good job on the large tree too, nice touch with the tin shed as well. I strive to reach that level of modeling. Keep up the excellent work Phil. Cracking work Phil - as usual! Wow Phil, what a journey. No wonder it looks so good - a real "specimen" tree. Hard work but very well worth all the effort. Just when you think that layout can't get any better.... Nice work Phil and congrats on the magazine features. Wow Phil !! I knew you were an engraver but didn't realise you did shotguns. Incredible stuff. Did those all start as "plain" guns or did the manufacturer give you something to work on ? I also notice they're cheap guns !!! Hi Peter, these cheap guns come to me in the white, ie polished steel, I do all the design etc. Sometimes I have to work with the customer but more normal is for them to suggest the scroll they like and also the birds etc. Most of my guns are for collectors and are not fired, some go straight into safes/lockups. They take various times to engrave, from a couple of months to around a year. The commissions come usually from the customer and also from the gunmakers. Here's another area i've just worked on, the literaly twenty year trees needed a makeover as the middle one especially was looking a bit tired and thin, pic 1. Pic 2, some stiff wire was pushed through to make a larger framework. Pic 3, Woodlans Scenic's light green foliage was added with PVA glue to fill the areas out. Pic 4, air laquer was sprayed on then medium green turf and then burnt turf was added, and sprayed lightly to hold. Pic 5, dark green turf was added to the left tree and light green the the right one. It's an amazing change from those ugly heavy wires to the finished article. Peter, as you can see from pic 4 I place paper sheets everywhere, to catch the surplus and to stop the spray from going onto the rails etc. I saw that Phil but assumed you used a vac afterwards to clean up the strays that miss the sheeting. If so, do you just discard that ? There's so little of the strays that I disgard them, however when there's not I just use a piece of fine cloth in the end of the tube, I guess thats standard practice. Not in my house Phil !!! This layout is truly inspiring. Some incredible detail and realism. Lovely work on the trees Ben and a useful "how I do it." I couple of question if I may? When you say that you just "push through" copper wire, is that all you do? Just push it through the existing tree and rely on the trees existing structure and foliage to hold the wire in place? Did you paint the wire or just rely on the foliage to disguise the "shine". Marty, the tree was too narrow, it needed some width. The wires were just pushed through, with the same amount showing either side, the existing hydrangea stalks were enough to hold them, but glue could have been added along the wires if needed. In this case they were not painted because I needed thick leaf cover and that would conceal the shine, but normaly painting is a good idea. There are quite a few grassy areas to the layout, these were done twenty years back using the lint pull-off method, the have now faded, they still look good but i'm thinking of adding static grass, you can see some of the areas in the last few pictures and the rest previously in this thread, any opinions on this? Thank you for your reply, it answers my questions perfectly. While I've seen static grass used to good effect on quite a few layouts I've never used it myself. I'd like to give it a go and probably will one day. For OO I feel that it makes a significant improvement to the vegetation on a layout.From what I've seen, mixing the fibre colours, e.g. 60% Green 20% Yellow 20% Tan prior to application produces a better representation of nature than using the solid colour straight from the pack. My personal feeling is that at 2mm to the foot in N scale (approx) the fibre has application for specific vegetation only. That being long grass, cropped fields and other taller grasses. A well chewed over stock field or well tended lawn can be better represented with scatter. Marty wrote: ............My personal feeling is that at 2mm to the foot in N scale (approx) the fibre has application for specific vegetation only. I couldn't agree more Marty. I think the use of too long static grass in some N layouts looks very unrealistic, furthermore some layouts I've seen in various scales seem to me to have too much of this type of foliage and often too bright colouring too! Keep it looking natural should be the watchword! Regarding your Hydrangea trees, do you thicken up the trunk at the base or just use the stalks straight (dried ofcourse), with the finer stalks (branches) trimmed down to shape ? Oh yeah, I almost forgot, the tree looks fantastic ! Gary, the trunks as they are are too thin for the overall size, I thickened mine out, as far as I remember, by binding and then with Polyfilla. The knobs at the ends of the stalks have to be cut off too. I seem to remember that when I did the binding, probably with string etc, I added a rod for ground fixing. I think it's also possible to add extra (trimmed) hydrangea stalks to the main one to thicken it out even more. What are the figures and how did you alter them for the poses ? The guy leaning on the shed with legs crossed and a mug of tea in his hand is superb, as is the guy with the newspaper on his knee. Wow !!! They look so real, not only as individuals but also the way you've made up the groups. Petermac wrote: Fantastic shots Phil. Luckily they did'nt need modifying! they are from Dart Castings, the trick is to arrange in good group poses. Phil: Mightily impressed by both your modelling and your 'proper' job. While I might aspire to some good modelling, I could never in a million years emulate your beautiful work illustrated on the link. I hope there are folk in training to take up the craft for the next generation. I taught my son Simon to engrave, twenty years ago, I was quite proud of the way he progressed, within two years he had a front page and an article in Shooting Times magazine. He has recently worked for Eric Clapton and Ron Dennis. It's this sort of attention to detail that makes a huge difference to a layout. Whenever I write a letter to someone, I add a footnote briefly explaining Ohm's law. It's my P.S. de resistance. Phil.c wrote: I taught my son Simon to engrave, twenty years ago, I was quite proud of the way he progressed, within two years he had a front page and an article in Shooting Times magazine. He has recently worked for Eric Clapton and Ron Dennis. Trev wrote: It's this sort of attention to detail that makes a huge difference to a layout. Two additions to the colliery, the scaffolding, made from 0.5mm brass rod, soldered and the overhang extension. The windows were drawn in Photoshop and printed onto transparency sheet. Apart from the fact that I wouldn't want to work on that scaffolding Phil , your posts are always a joy to study. The water tower is the closest to real concrete that I've ever seen in model form I think and, as ever, it's the tiny detail that sets your work in a different league. The slightly differing lengths on the corrugated sheeting, the missing window pane, the neat chimney pipe exiting the cantilevered lean-to and the very believable girder supports for the same "outpost, to say nothing of the authentic grouping of the characters. Beats chewing Easter eggs any day. Fantastic detail in those scenes! At first glance, I did wonder at the placement of a "toilet bowl" on your layout though! Thanks for posting the latest batch of pictures Phil. Really impressed by the scaffolding. I remember as an apprentice plumber in the 1960's climbing up and down such structures with ease. Nowadays, be lucky if I get past the first level, prefer terafirma in my advancing years. That a side, keep up the good work Phil. Having worked as a scaffolder for a very short time, those 25foot steel poles make a real dent in your shoulder when you carry them I would suggest if you want to be very accurate that you need diagonal 25 foot poles going from the bottom outside of the scaffolding to the inside (or next to the building) on the ends of your rig. This is to brace it against the builing to hopefully stop it peeling away from the building . Happened in Shrewsbury, shropshire one time in the late 1970s blocking a road . Magnificient.... This is a superb model. With all the cameo scenes taking place, I could sit in your railway room for days just admiring your attention to detail ! I must say Phil, until you mentioned the handrail on the first level, it was'nt noticable. I was too busy looking and admiring the detail on the other aspects of the model. I think this layout is superb. I love all the attention to detail and that it is not all pristine. I admire your handiwork and your ability to group things so they look so natural. Keep up the good work as I need all the inspiration I can get to spur me onto making my own layout. Thanks Gary, Barney and Simon! Many thanks Phil for sharing your superb railway, I have spent a very pleasant time looking at all the wonderful scenes. An excellent example of model work at its best. Well, that's very kind of you a derek, thank you. Here's a couple more, plus an area that needs work, any ideas? Great stuff, Phil. I would not dream of suggesting painting or covering that lovely window with its great view,s ! On the trackside perhaps rocks and rough grass, with gorse bushes and lot,s of sheep, Maybe an old tumble down cottage. Also if you are going to bother perhaps a junction signal? Nothing to high so you can reach across easily? As Derek said, lovely view but is that white stuff I see on the top of the hill ........................? Are those "moorland ponds" in the last shot ? If they are "moorland", then just some low heather type plants on the "moonscape" and perhaps the odd rock boulder. If it's not moorland, then it needs some slightly taller vegetation and, at the edge of the ponds, maybe some reeds and bulrushes......................The odd tree would break it up a bit but would also spoil the view. A few trees might be needed, as Peter suggests, to break it up. I also like the idea of an old tumbled down farm cottage/s. That is the remaining snow you see, these pic were taken yesterday, temperature 3deg c.
Here's some Photoshop, just for taking pics of that area. 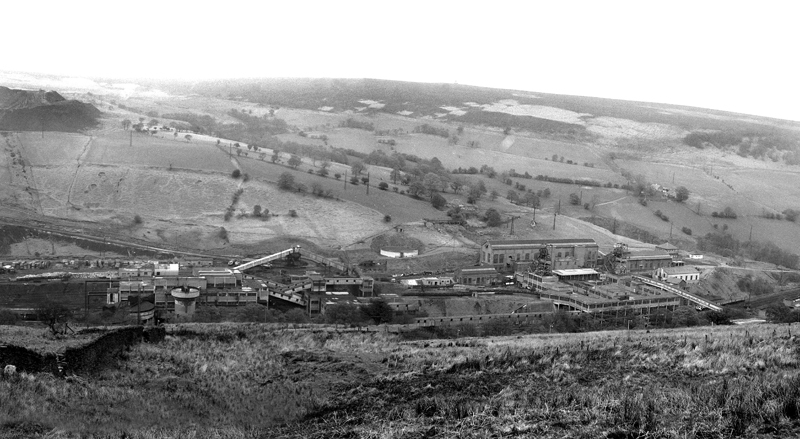 PS Derek made a nice comment about the view so here's a few more pics, my house is the one right down the valley, just after a lake which is just visible, it used to be the colliery managers house, the colliery was on the left, it's now a country park. The second picture is from my front door, the little path leads to a natural quary with a waterfall, Dr Who was filmed there in the early 70's. Lovely countryside around your area Phil thanks for the photo,s. I see you have a backscene across the window. which with its scenic view is not dissimilar to the real thing.Also at night you will have a lovely country view, Good Thinking. Nice one Phil fooled me, Still It gives you an idea of what a backscene will look like. Oh I mentioned in another thread track work ect old for new post. Cleaning rails a cheap fairly easy method apart from tunnels. Using Denim or cork sheet as a cleaning material. I notice on this shot, and the one prior to it, that you have a very, very long switchblade on the inner track Phil. In this shot, it almost looks like dual-gauge. Why is that or is it "camera stretching" ? No POINT in it done twenty years ago for an unknown reason, I wish it wasn't that way but too much work involved to change it. From eye level it's not noticable! As fot the corner in the picture, by the colliery, i'm thinking af adding a fillet there to make thinks flow a little better. Well, I'm not going to photograph what's outside my window... Fantastic views you have Phil. As for your railway, what about a length of dissused and overgrown railway line from a former quarry ? No need for points as you can claim that they were removed years ago after the collapse of the quarry. Afterall, you do have a quarry/mine scene in the corner. Hope you don't mind, but I think I'm going to steal those conveyor sheds that you have going over the railway in this pic. i'm thinking of adding a fillet there to make thinks flow a little better. Make sure you cook it first !.. Here's a picture of the colliery that was almost outside my house (the managers house) The washery was in the place of the lake just visible on one of my other pictures. 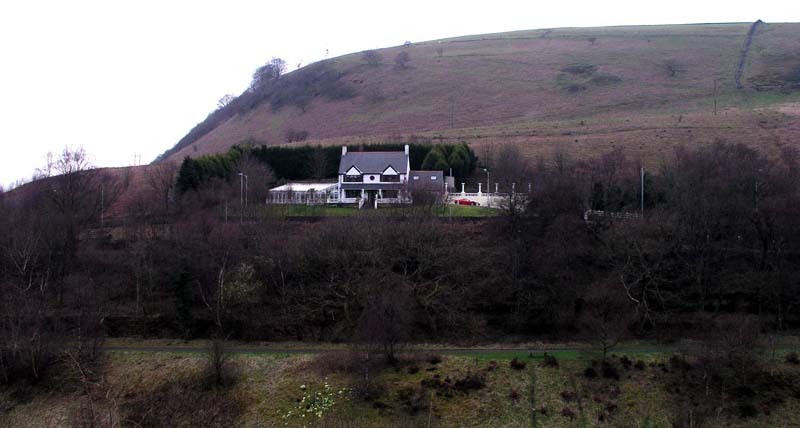 Also, a picture of my house, taken from the quarry, of course, it didn't look then like it does today. The railway line is visible just below, it is now a bicycle track. From that black & white pic above, I can see where the inspiration for your layout came from. Just a few similarities ! 61xx South Eastern Finecast, etched chassis with Mashima motor and flywheel, 60.1, Finescale wheels. You sure can handle the software when it comes to enhancing your photographs Phil. That last shot is a real cracker. How long has it taken you to get such a good grip on Photoshop? You took a photo of the real train, and photoshopped the fence in. Robert, as far as i'm concerned i'm still fumbling about What i've learned has come by accident or by trial and error! It all started when I wanted to take pictures of my work with a 35mm real film, I would take the shots, have them developed and printed only to find that they were rubbish!, Today of course is a different matter as you can see what in your camera straight away, but I have found that no matter how good your camera is, the pictures still need editing, Photoshop is excellent for this. The trickery things are mainly to do with trains etc, it's good fun. Stunning photo Phil - "shopped" or not !!! Peter, I'm no expert but if forum members want to do something like this in PS i'm quite willing to help out. I'm sure a "Photoshop Tutorial" would be a most welcome addition to the club Phil. Please will you start one in a new thread. As there's a lot to a tutorial, first I would need to know what to base it on, for example, the picture of the 61xx or something else? and are there guys out there that would actually like one. How many people have PS ? As you've already done it Phil, the 61xx would seem like a good place to start. As far as how many people have PS, I doubt there are many - it's not a cheap gadget so, unless you're "into" photography, you're not likely to buy it. Nevertheless, it's an interesting subject anyway and who knows, a "tutorial" of sorts showing what it can do and how, might swing some waverers into opening their wallets or even prompt those who know nothing of it to have a closer look. I thought he was called " Manuel" or "Sgt Schultz:" - depending on which TV show one saw.? More to the point,i don't have PS but Gimp is a free program,would members be able to follow with that?. Alan, i've looked at Gimp on youtube and it looks like it's based on PS with layers etc. To do a tutial as Peter suggested, for beginners or Manuel would need step by step explanations with screenshots, most of the moves would be similar in Gimp but not exactly the same, so I can't comment on how easy it would be to follow. Phil.c wrote: Alan, i've looked at Gimp on youtube and it looks like it's based on PS with layers etc. To do a tutial as Peter suggested, for beginners or Manuel would need step by step explanations with screenshots, most of the moves would be similar in Gimp but not exactly the same, so I can't comment on how easy it would be to follow. That's ok Phil,i'm useless at using these programs anyway but i'll give it a go. Poking my head above the parapet, I actually teach Photoshop and other photo editing programs. So if you do have any questions about any photo editing programs I would advise a new thread perhaps on the Computer Programs section. I would like to see a tutorial because I admire those who have mastered techniques that I have given up on. More importantly it will go into the Forum Index and be there for future members to refer to as well as the present ones. Thanks Simon.I might need to take you up on that. Just thinking, Simon is a teacher of PS, he's the pro here, perhaps he would like to take over a tutorial, i'm sure he will have different techniques to me! I teach the "quick and dirty" way of doing things . None of your "their is only one way to do it - the proper way" for my students. The less steps to remember the better I say. Having used Photoshop since the 1980's when it didn't have a version number because it was so new I have learnt a bit about it. I don't profess to know it all as I used it commercially so was only concerned with getting the job out as quickly as possible. The printing presses cost £4,000 an hour whilst idle at the place I worked so there was quite an incentive to get the work done quickly . Also once taught a chap who had severe memory impairment - to the extent he would ask the same questions at each weeks sessions - he had had several strokes. One week he discovered an old photograph and I taught him how to "clean it up". He came back next week and showed me several techniques on Photoshop . I learn more when I teach than when I am a pupil . If Robert would like to let me know where he would like the tutorials I can start with the basics and move on from there. I am out at the Melksham show this weekend but hopefully can start something next week. Sorry about thread hijack Phil. OK Simon I have made a post here in the link shown below so if you could just carry on from there that would be great. Absolutely brilliant Phil. How long do you reckon to take on each of those pictures you have just shown us. This one took about four hours Robert, mainly because all those little areas in the bridge had to be cut out to allow the smoke to show through. They are quick and easy to do but there are so many of them. The 61xx picture took a lot less time. You can do five minutes at a time if you want, I did'nt do it in one sitting. Phew - that's good to hear. Peter, here's the basic untouched picture. I can see why you're hooked on Photoshop Phil. What a difference between the "before and after" shots although I must say, the "before" one is pretty darned good to start with. I suppose it always poses that question of how much is modelling and how much is computer technology. I'd guess it won't turn a pig's ear into a silk purse but it certainly gives it that extra "wow factor". In that respect, PS is indeed similar to, although better than, the tools photographers have always used to get the best end product. One of the best things about PS is that once you've got the layers and paths done, for example, you can delete the sky/smoke etc that you've created and drag different ones to replace them, thus creating a new scene. I can't think of anything else to say Phil that I haven't said already, so please take it as said all over again. I just thought I should mention for anyone who is thinking of doing this with the free downloads that are available, yes it's possible, but if you want smoke/steam to go between/behind areas such as trees bridges etc, it is much easier and indeed necessary to use layers and paths such as Gimp that Simon (spurno) mentioned. Some of the other free downloads don't have these. It depends on what you want to do and how deep you want to get. PS. Here's a picture with the colliery area blurred to give more focus to the goods shed etc, this can be easily done with the marching ants technique that Simon is showing in his Tutorial. Is there no limit to this man's talents ? Superb shots Phil - even before the "enhancements". The whisp of steam coming off the radiator is the give-away Paul. I don't usually take shots as I go along just at the end...if there is an end As you say a photograph shows the errors, I think that when looking at the real thing, there is so much 3D information that the brain absorbs it as a whole, when looking at pictures we can focus on specific areas. Here's another picture to show the versitality of Layers and hopefully a sweetener for those following Simons tutorial and who want to invest in the upgrade program packages. The smoke/steam has been reversed and erased under the bridge and it also shows through the bridge's latticework. This is possible because the main picture is on layer 1, the smoke on another layer and the bus radiator steam on another. For those not familier with layers, they are like sheets of paper and each has it's own image, so for example the top layer/picture will be the only one visible unless a hole is cut into it or an erasor used, then the picture on the second layer will be seen. The area above the sheep has been blurred also, this was done with a similar method as shown in the tutorial. My brain is obviously full !!! To create that scene without "checking" via a camera is wonderful Phil - I suppose your "day job" probably helps a little but I'm blown away by it. As you know my day job is all about detail and it's been that way for the past thirty years so perhaps I just take it for granted when modeling. That'll beat your earlier Box Brownie Phil. How did you know I was using my trusty Box Brownie! I had forgotten how much I enjoyed Pen Y Bryn. You have created some remarkably effective scenes.........and thats before the enhancements........now that I am dipping my toe into Photoshop Elements I can better apprciate what a super job you do. Back to my marching ants......once I have mastered them hopefully I will be ready to post an intelligent question in the right forum! If I remember right, Elements has'nt got Paths?